Down in the sewers, April is practicing the stealth lessons Master Splinter taught her, but she’s quickly caught by Michelangelo. Splinter compliments her technique, saying that her skills as a kunoichi are improving. April, however, is impatient and wants to use her skills in the field (mainly in trying to find her missing father). 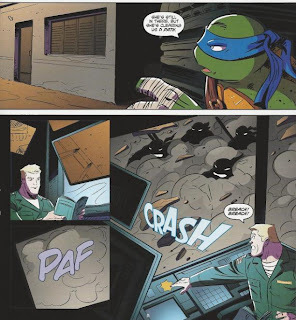 Donatello jumps at the chance for a little alone time with April, asking if she’d like to join him on a stealth mission to a military junkyard for some parts. April is happy to go, much to Leonardo’s disapproval. At the junkyard, April puts on a dark wig to disguise herself in case she’s seen, then she and Donnie cross the barbed wire and begin skulking around. Donnie says that the place is a dumping ground for failed, state-of-the-art military prototypes, as well as a great place for scavenging parts for his inventions. Donnie yanks a diode module from a laser cannon and hands it to April, just as a guard comes by on his rounds. The two flee for the exit, but April is cornered by a guard dog and taken into custody. Donnie immediately calls his brothers for assistance in springing April. Down in a sublevel facility, the Officer in charge questions April as to what she was doing with their diode module. April insists that her name is “January McAndrews” and that she was just on a silly teenage dare. The Officer points out all her ninja gear they took from her and demands the truth. Donnie meets up with his brothers and they formulate a plan. They want to get April out without being seen by the military, but also without hurting any of the soldiers (as they aren’t bad guys). They start blowing up some of the prototypes to create a distraction, but it isn’t good enough to clear the entrance to the sublevels. April overhears on a walkie talkie that someone is causing a disruption above and decides to help her friends out. She tells the Officer that she’s really a spy and her friends have arrived to steal the military’s experimental laser cannon. The Officer immediately orders all hands to guard the laser cannon, thus clearing the entrance to the sublevels for the TMNT. Using smoke bombs, the Turtles begin subduing all the soldiers in the sublevels as Donnie deletes the security camera footage for the night. In the confusion, April manages to judo-flip one of the guards, steal his key card and make a break for it (though she loses her wig in the process). The Turtles find themselves chased into a corner and out of smoke bombs to hide with. Luckily, April finds the power controls and shuts off all the lights. The Turtles sneak/fight past the guards, find April and escape into the sewers through an access shaft. As Donnie removes April’s handcuffs and they all head back to the lair in the Shellraiser, April gives Donnie a little gift: The diode module. Later, Splinter expresses his disappointment with April for going on a mission she wasn’t ready for. She apologizes, saying that she let her impatience get the better of her. Leo gets her back, though, saying that she exhibited great ingenuity and skill in escaping. Donnie then invites everyone into the kitchen to witness his latest invention: The laser pizza slicer. He sets it too high, however, and slices the table to pieces. *This story is continued from TMNT New Animated Adventures: Free Comic Book Day 2013. The story continues in TMNT New Animated Adventures #2. *The government junkyard was first mentioned in the episode "I Think His Name is Baxter Stockman." *Michelangelo mentions how he isn't allowed to use smoke bombs because he doesn't appreciate them, a reference to the episode "The Gauntlet". *April uses the T-Phone's automatic self-destruct command, first utilized in the episode "Mousers Attack!". *Donnie introduced the Shellraiser in "The Pulverizer". *This issue was originally published with 5 variant covers: Regular Cover by Brizuela, Subscription Variant by Kevin Eastman, Cover RI by Ciro Nieli, San Diego Comic Con Variant by Tony Fleecs, and Awesome Con Variant by Steve Conley. New Animated Adventures looks to be a fun diversion from all the continuity and long gestating story arcs of IDW’s main TMNT comic series. While I don’t know how long it will keep to these brisk, one-shot adventures, I hope the format sticks around for a while. 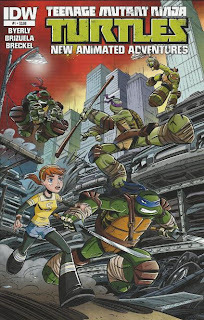 Of course, the one-shot nature of New Animated Adventures is kind of necessary, as it has the unenviable task of trying to take place in-between episodes of the Nickelodeon TMNT cartoon series. Easier said than done, honestly, as one creative team trying not to contradict another creative team without having any control over what that other creative team is doing… can’t be anything less than a headache. The Free Comic Book Day 2013 issue of this series was already contradicted by an episode of the Nick cartoon that aired a week after the comic was released, for example. Still, whether the folks behind New Animated Adventures decide to branch out and follow their own path diverging from the Nick show, or whether they stick to the “one-shot adventures in-between episodes” format, I think this looks to be a solid book. It’s a bit like Mirage’s old Tales of the TMNT volumes, in that manner. As for the story by Kenny Byerly (who is a writer for the Nick cartoon), I quite enjoyed it. The Nick show’s April has been one of the better versions of the character, so I was happy to see this proper first issue of the comic devote the greater focus on her. It’s always nice to see April with a few flaws, as writers tend to make her a bit overpowered in other universes (a tech guru as intelligent as Donatello and a ninja as skilled as any of the Turtles… yeah, that’s pretty overpowered). Here, she’s still learning from Master Splinter and faltering in her training, as expected. While I’m not entirely caught up on the show (as of this writing, I think I stopped watching around “The Pulverizer” and haven’t gotten back into it), the cartoon wasn’t devoting a whole lot of time to April’s actual training, so it’s good to see this comic picking up the slack. Better yet is the way April manages to think her way out of a serious situation. She never loses her cool and applies Splinter’s lessons to craft a more subtle strategy. This method manages to SHOW us her intelligence and resourcefulness rather than TELL us about it. Most stories that focus on her “hacker” skills to convey her intellect to the audience tend to fall among the latter (telling us, not showing us), as that sort of talent is a “take our word for it” deal in comics (much like “the character is really good at singing, we swear”). In regards to the Turtles, I was pleased that they understood not to injure any of the guards (though they sort of do, anyway). In this situation, THEY’RE the bad guys (stealing military hardware) and the guards are just trying to protect their property. It may not seem like a vital distinction on the surface, but even a throwaway line where the Turtles acknowledge that they’re in the wrong and have to be “gentle” goes a long way in keeping them from looking like a bunch of bullies, jerks or criminals. Dario Brizuela was the perfect choice for art duties. He’d previously worked on Mirage’s second volume of Tales of the TMNT, where he did great work, but his art style wasn’t always an ideal match for the grittier material. 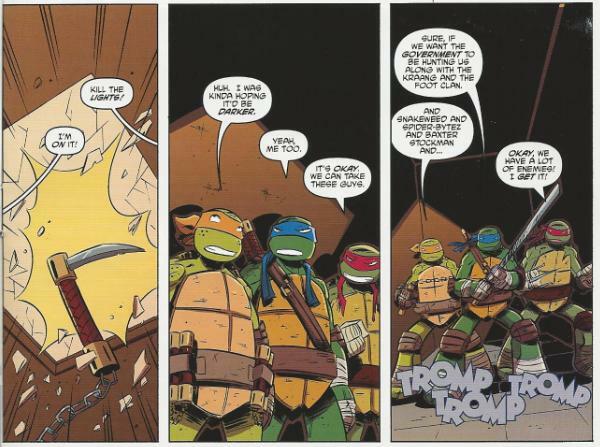 There’s one issue of his in particular, Tales of the TMNT (Vol. 2) #67, where he tries to apply those exaggerated “anime style” facial expressions to the characters and it just wasn’t a good fit for that universe. The Nick cartoon, on the other hand, employs over-the-top “anime style” reactions and expressions relentlessly, so Brizuela is free to indulge in that vice as much as he likes in this comic series. The action’s well laid out and the characters emote both subtly and outrageously (the aforementioned “anime style” effects). April still looks like a plastic mannequin, but that’s admittedly a problem inherent with her animation model and less Brizuela’s fault. Overall, it’s good stuff. Like I said before, it’s nice to have a TMNT book that’s “light reading”, so to speak. And even though the events of the title are tied into a cartoon series you may or may not have seen, the stories seem perfectly capable of surviving on their own merit. I certainly haven’t watched every episode of the show and I’m following these New Animated Adventures just fine. LOL yeah, it's weird how they designed April's legs to be so huge below the knee. One can forgive it for the boots she seems to wear normally, but then she wears other outfits and still has those big feet. I like the small references to the show. April making the tPhone self destruct was a ref to one of the episodes, and of course the Turtles named off all the enemies they faced on the show before. I like it. Nice little nods to people paying attention to the show. Do you think this series will go on to become its own continuity, like the Archie TMNT series did (become more mature and whatnot)? For someone who hasn't been able to watch every episode, you sure connect those plot point references to the specific episodes better than I would be able to do! How was The Free Comic Book Day issue contradicted by an episode of the Nick cartoon? Both the TMNT New Animated Adventures FCBD issue and the episode "Return of the Pulverizer" use the same plot device, the Turtles switching weapons at Splinter's instruction, and both treat the scenario like it's the first time it's ever happened. Obviously it was just a coincidence, but a contradiction between the two media never-the-less. Me gusto la historieta porque no tiene las limitaciones de la animación por computadora, ademas de que podemos ver un mayor dialogo entre los personajes. 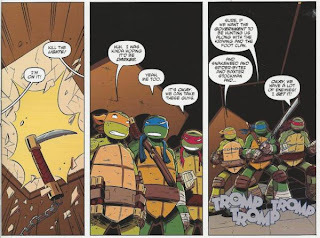 Me encanto el comic de las TMNT porque tiene mas tiempo para contar una historia y no esta limitada por la animación de computadora, ademas de haber un mayor dialogo entre los personajes. 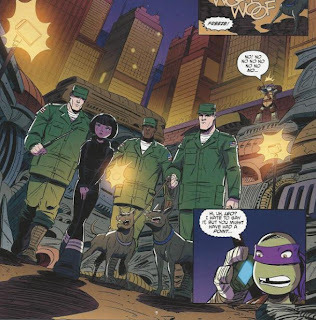 I loved the TMNT comic because it has more time to tell a story and not limited by computer animation, in addition to having a greater dialogue between the characters.